Search.MyTelevisionXp.com usually replaces homepages, search engines, and modifies New Tab pages after users install My Email XP software. In most cases, users click on the Install button because they believe that this software can help to login to email faster as it promises. The application really claims that you will not need to waste time typing the URL of your email service anymore, but it does not seem to be true. In fact, we have only noticed that it makes changes on all the browsers. If you have downloaded My Email XP program, you have probably agreed with the changes; however, users also say that Search.MyTelevisionXp.com has replaced their homepages, search providers, and New Tab pages without permission. 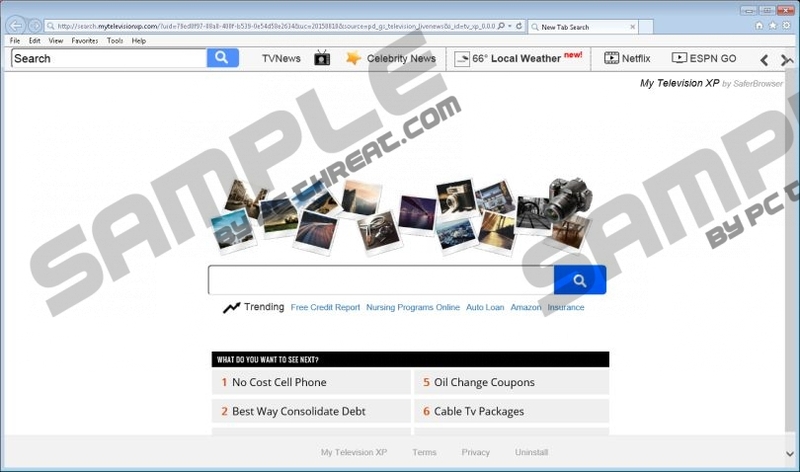 Therefore, some researchers classify Search.MyTelevisionXp.com as a browser hijacker. In order to restore the changes, you have to get rid of Search.MyTelevisionXp.com as soon as possible. We are going to explain you how to do that in this article, so make sure that you read it. Specialists at pcthreat.com do not think that Search.MyTelevisionXp.com can be trusted even if it uses Yahoo! service. It is because this program might provide you with sponsored search results. In most cases, all these third-party links and advertisements do not differ much from trustworthy search results, so many users click on them. In most cases, nothing bad happens, but there is still a huge possibility that you will be redirected to some kind of untrustworthy website after clicking on the link or ad provided by Search.MyTelevisionXp.com. According to our researchers, it is very likely that Search.MyTelevisionXp.com will record the search queries you enter into the search box. On top of that, this search engine might record other details about you too, so it is better not to allow it do that. In other words, you will not regret if you get rid of it. If it was a surprise for you that Search.MyTelevisionXp.com replaced your homepage and search engine, it means that this has been done without your permission. In most cases, hijackers do not travel alone, so it is very likely that a bunch of other untrustworthy applications have also slithered onto your computer. In most cases, users do not notice that they are not alone for a while, so we still suggest scanning the system with a diagnostic tool even if you have not noticed anything suspicious yet. Only a trustworthy tool will detect existing infections, so you should acquire one and scan your system. If it turns out that infections are really installed, make sure that you eliminate them from your computer. According to our researchers, Internet Explorer users can get rid of Search.MyTelevisionXp.com by simply erasing the software via Control Panel, whereas Mozilla Firefox and Google Chrome users will have to remove add-ons from browsers. We have prepared the instructions in order to show you how to do that, but you can, of course, use an antimalware tool. This method is definitely quicker and easier, but you will have to acquire a trustworthy antimalware tool first of all. SpyHunter is one of those tools; we are sure that it will erase all kinds of infections from your system and will protect your PC in the future. Launch RUN and enter Control Panel in the box. Click OK and then go to Uninstall a program. Right-click on the undesirable software and click Uninstall. Find the suspicious software on the list and select it. Open your browser and access the Tools menu (Alt+T). Select Internet Options and click on the Advanced tab. Click Reset and put a tick in the box next to Delete personal settings. Open your browser and access the Help menu (Alt+H). Select Troubleshooting information and click Refresh Firefox. Click the Refresh Firefox button once again. Open your browser and tap Alt+F. Select Settings and click Show advanced settings. Quick & tested solution for Search.MyTelevisionXp.com removal.